A few days after leaving Afghanistan, where I had my first experience with Women for Women International’s program, I travelled on to Kosovo, the second stop in my tour. WfWI opened its office in Kosovo in 1999, the same year the Kosovo War ended, and so far has served over 30,000 women there. Shortly after arriving, the differences between the women we serve in Afghanistan and those we serve in Kosovo became quite clear to me. During a visit to a vocational training center in Sllatina, I was struck by the fact that even though the Kosovar women were socially excluded and from households with limited assets they were eagerly recording tips on how to improve production of lettuce in their gardens and greenhouses in their notebooks. This was a stark contrast to Afghanistan, where few of the women enrolled in the program had basic numeracy or literacy skills. While on the whole women in Kosovo face far fewer dangers than those in Afghanistan, their lives are far from easy. Their struggles are very different, but the will and determination to move past them is the same. One of the major challenges facing women in Kosovo right now is a deeply troubled economy. Over the past few years, Kosovo has had very little economic growth. The unemployment rate stands at 45%, among the highest in Europe. But for women, the economic situation is even worse, as women’s unemployment is at 55% and only 6% of businesses are owned by women. Nearly half the people of Kosovo are living in poverty. Signs of limited economic opportunities were everywhere in the homes we visited with several family members crowded into limited space, in the costs of food in the markets and the income earning potential of the women we worked with, in the numbers of youth gathered in public spaces with little or no prospects for work. Early in my travels in Kosovo, I met a woman named Lindita Balas, a thirty-year-old mother of five who was participating in WfWI’s program. Five days after giving birth to her youngest child, Lindita decided to enroll in the program. Just two months in, Lindita has already learned skills that are going to help her increase her economic independence by selling vegetables she grew in her kitchen garden. She told me how the opportunity to meet other women and network with them had given her encouragement and confidence to try something new like this. Lindita was married at 16, and hasn’t had many opportunities to do something for herself, but she told me she enjoys gaining a broader understanding of her rights and building relationships with other women. Across the country, women are seeking opportunities to earn an income to support their families. For the women enrolled in WfWI’s core program, the business skills training they receive is giving them crucial skills for success. In learning how to price their goods, how to market and sell their products, and how to plan investment needs, women who before had few economic opportunities begin to understand how they could take the leap into business. Many of the women I met were eager to try to save enough money to build their own greenhouses. It was clear that any seed capital for these budding entrepreneurs would go a long way to opening up opportunities for selling produce within the communities where they lived. The women know that success will take a lot of hard work, but for them it’s more important to depend on themselves than others. One of WfWI’s graduates Abetare Balaj Halili told her life story how given her political activities prior to independence she was imprisoned several times, she had to quit studying after completing high school. Enrolling in the WfWI program convinced Abetare to do something for her and her family. She saved some of her training stipend, and she started a business to decorate cars for weddings. She used the business training to carefully cost her inputs including the costs of ribbon, and the chiffon she used to decorate the cars – given that weddings were by and large recession proof she had succeeded in developing a thriving business. Her profit margin was sufficient to provide for both herself and her family. With such poor economic conditions, the Kosovar women WfWI serves are putting themselves at a competitive advantage in the marketplace. By learning beekeeping, horticulture, dairy production, or capturing a market trend in the service industry, women are able to create new opportunities for success. Learn more about how you can become involved and support Women for Women International’s work in Kosovo. Over the next few months, WfWI’s new CEO Afshan Khan will be visiting each of WfWI’s eight country offices and sharing her experiences of the different people and places that are part of WfWI’s mission to change lives, one woman at a time. This is her second blog post from Afghanistan. On my third day in Afghanistan, I had the opportunity to visit a group of women who use the vocational knitting skills they learned during their time with WfWI to earn an income, producing high-quality accessories for international markets. In talking with the women, they shared with me how the extra income has made a huge difference, not only in what they can afford for their families, but also in their treatment by others in their family. Earning an income is not an easy feat in Afghanistan. Over a third of the people are considered to be in poverty, and half the people are vulnerable to falling into poverty. WfWI participant discusses vocational training with an instructor. I’ve seen firsthand in my time here how many challenges women in particular face when they try to earn an income. Passing through the marketplaces and bazaars, there are numerous women on the streets, but not one woman is selling anything at any of the stands. Though it is not acceptable for women to publicly sell items here, they often produce the goods that are sold, working in isolation in their homes. For example, the majority of Afghanistan’s economy is agriculture-based, and women do a large amount of the labor. But they don’t own the land or the means of production, and so they don’t have control over the resources they produce. Since they are excluded from the sales process, their profits are taken from them. For women, earning an income offers new opportunities to take care of themselves and their families. When women are able to contribute to the well-being of their families in this way, it often changes how they view themselves and their worth, and has a similar impact on other family members who benefit from the increased household income. To help women gain greater control over their economic activities, WfWI’s staff is training women not only in vocational and business skills, but also how to form groups and transform them into cooperatives. By joining together, women are able to build in a layer of economic security and ensure fair payment for their work. A women’s cooperative can afford to hire a male salesman and a stall in the bazaar to sell their goods, putting them in greater control. Together, women can also access larger markets in Kabul, rather than relying on smaller village markets. When I visited with women who were members of a poultry coop in Parwan, they told me how cooperatives offered them numerous other benefits as well. They give women a sense of security and belonging as they begin to work, often for the first time. Working in a coop can also provide women a greater awareness of their own personal influence and importance in a local organization. Coops become a forum for collective problem-solving, and promote other democratic values such as equality, personal responsibility, openness, solidarity, cooperation, and social responsibility. Women’s coops in Afghanistan face a number of hurdles though, such as high illiteracy rates, lack of access and control of resources, restricted mobility due to insecurity and gender norms, and lack of community support. 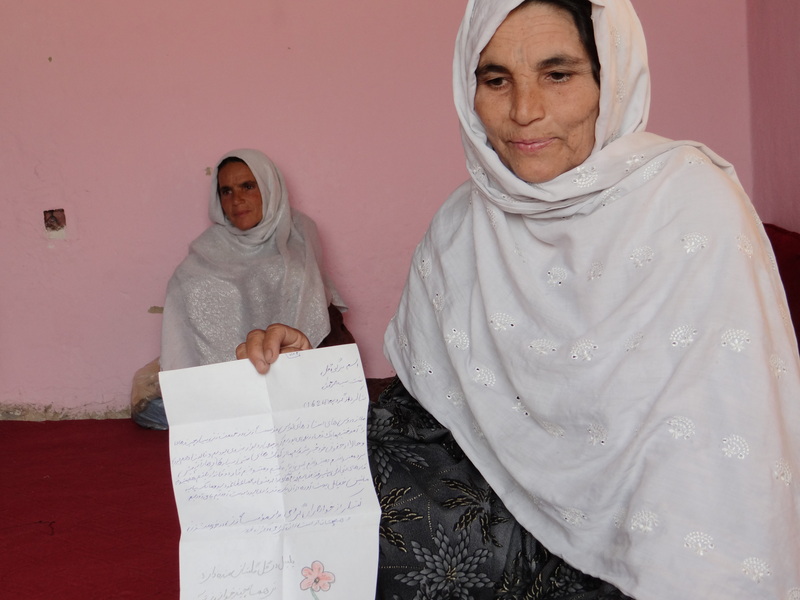 WfWI participant Bagi Gul, with a letter from her sponsor, Glenna. In order to create a space for women’s economic participation and protection of their rights at the community level, WfWI’s staff in Afghanistan has been working with local mullahs and imams, sensitizing them to women’s issues. This Men’s Leadership Program (MLP) is an effort to raise awareness with community leaders about the negative effects that violence against women, economic restrictions, and disregard for their rights has on an entire community. After our staff works with these trusted leaders to build their understanding of women’s rights, the leaders then work with the men in their community to ensure they also understand why it’s important to safeguard women’s rights and ensure violence against them stops. It creates a space for a shift in attitudes towards women to begin. Men become allies, paving the way for much faster and certain inroads for women. After talking with our staff about the MLP, one question stuck with me. How do you start the dialogue with male community leaders who have perhaps cared very little for women’s issues in the past? How do you get them in the room for training on women’s rights? And so far they’ve had great success. Over 560 mullahs have been invited to give our staff advice and have ended up with a better understanding of women’s rights. In turn, WfWI has been invited by many mullahs and imams from other villages to bring our program to the women (and men) of their communities. Change can and does happen, if done the right way. As the end of my time in Afghanistan nears, I’m savoring each moment – the strong smell of the tea we drink all day long, the magnificent view of the Hindu Kush Mountains that seem to float in the distance, and the echoes of the call to prayer after sunset. But most of all, I’ll miss the warmth, kindness, and utter hospitality of the many people I’ve met here. They have an amazing inner strength to keep life going, despite all the terrible things happening around them. I am humbled by their courage. Check back soon for my next post from our programs in Pristina, Kosovo. Learn more about how you can become involved and support Women for Women International’s work in Afghanistan. Over the next few months, WfWI’s new CEO Afshan Khan will be visiting each of WfWI’s eight country offices and sharing her experiences of the different people and places that are part of WfWI’s mission to change lives, one woman at a time. This is her first blog post on her journey. In the past few days I have had the opportunity to travel to Afghanistan and see first-hand the impact of the work of Women for Women International. In a country that has recently been in the press for the brutal treatment of women, including the public execution of a young woman by the Taliban for alleged adultery, I witnessed the diversity of opportunities for women. As I met and spoke with women there, I was reminded that even in the harsh reality of a country where 90% of rural women are illiterate and maternal mortality is one of the highest in the world at 460 deaths per 100,000 live births (compared to 21 per 100,000 live births in the US) all the women had dreams of a better future for themselves and their daughters. Against all the odds, they had sought change and created opportunity so that as women they could define their destiny. I found none of the passivity nor victimization that is so readily portrayed in the press – what I found were determined women, who broke barriers to enroll inWfWI’s program where they learn to sustain an income, improve health and wellness, engage in family and community decision-making, and participate in social networks and safety nets. They continued to challenge the boundaries around them by opening their own business, forming networks or associations, and daring to dream of a future where they can readily earn an income, contribute to their families’ needs, send their sons and daughters to school, and act as agents of change in their own communities. This was the story of Zergona Sherzad a WfWI graduate who was producing women’s clothing and employed more than 80 women. It was the story of Raisa Jahn and Mehbooba Jahn who welcomed us to their modest home in Kabul where in the front room they had set up a very small beauty parlor where they cut hair, shape brows, and provide make-up to brides. They proudly showed us their products, and I watched as they carefully plucked the brows of their client. Nowhere was this determination more apparent than in Istalif. There I met a young woman, Shazia, who had walked two hours from her neighboring village to try and enroll in WfWI’s program that will start in September. I cannot get the image of Shazia out of my mind, a young woman in her early twenties who no doubt had to seek the permission of her husband or her brother or her father to make the long trek from her village of Shurawa to Istalif, a verdant village in the hills surrounded by mountains. Her piercing eyes showed her determination as she told us she had walked for two hours to get to the enrollment session. With her blue burqa tossed over her head and her headscarf casually draped over her curls, she was adamant in her commitment to attend the yearlong training sessions. She spoke clearly of her burning desire to learn a craft that would give her the dignity of being a contributor to the household income, and allow her the opportunities to share her dreams, her hopes, and her fears beyond the confines of her home with other women whose imaginations went far beyond the four walls of their mud homes. Sweeta Noori, WfWI-Afghanistan’s Country Director, and I sat and listened to women as they identified barriers to building on the assets and skills they already possessed. They needed to create a market where women could sell and buy. In Afghanistan while women are often buyers in markets, they are traditionally not allowed to sell their goods. Men are the sellers in the markets. These women wanted help in setting up a local market for women, and they wanted to learn the business skills necessary to determine the costs of producing their goods and the market price at which they could be sold. A few of them had sewing machines but needed additional training so that their products would be of good enough quality to sell. Many of them had chickens and eggs but wondered what was a safe way for them to sell their produce, and how could they access the market? Sweeta patiently translated these concerns and many more. I listened and learned of the profound importance of adapting Women for Women International’s income generation programs to the cultural realities of each community we work in. 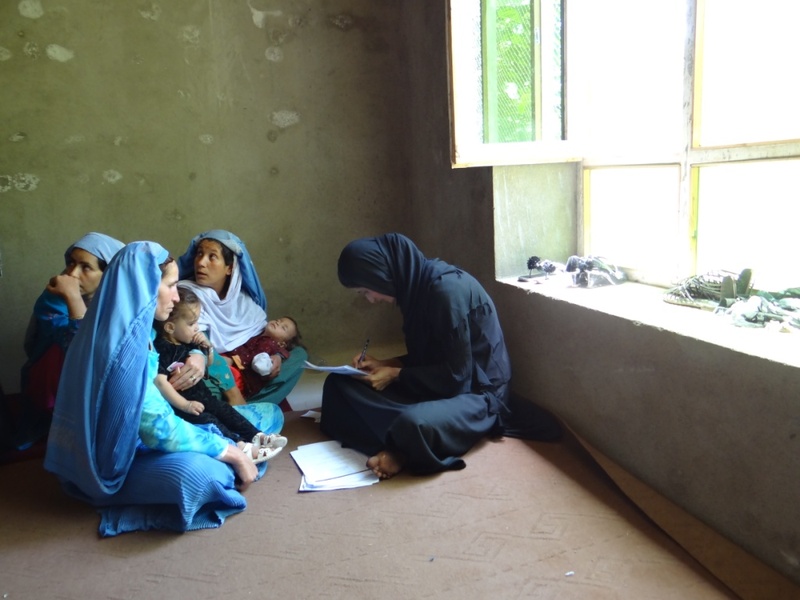 Women enrolling in WfWI’s yearlong program in Istalif, Afghanistan. Several hundred women squeezed into the women’s community council in Istalif, a small building with wooden beams and concrete walls that had been built with support from a woman in Virginia. This small building allows women a place to meet and gives the WfWI enrollment team an opportunity to interview and screen potential candidates for our yearlong program. In the room, three women carefully screened and interviewed each of the potential candidates. One of the head trainers tried to keep some semblance of schedule and order as hundreds of women jostled and pushed to be first in line and enter the room. It was a brutal reminder of how committed these women are to redefining their lives. Women for Women International in Afghanistan could make it possible for 245 women in this group to have that opportunity; others who squeezed into the room were put on a waiting list, and some may have to wait another year before they can join. The resources are not available to accept them all. Women for Women International will enroll more than 4,750 women in the core program in 2012. What this day made clear to me was that if Afghanistan could seize the potential of its women, they would surely change the image and the destiny of their country.